Burnley skiing ace Robert Holmes is taking plenty of positives from a week at the English Alpine Championships that saw him collect two gold medals. The 15-year-old alpine star finished sixth in the giant slalom on day five of the Championships that are taking place in Bormio, Italy, but had already won both Super G events earlier in the week. 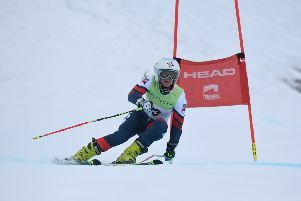 The teenager, who attends Park High School in Colne, was also going extremely well in the slalom, sponsored by Rossignol, on Wednesday but unfortunately wasn’t able to finish his run. “The GS was a little bit disappointing because I wasn’t technically good enough on the steeps and I just left myself a little bit too much work to do on the flats,” said the Team Evolution racer. “It wasn’t really my best skiing but the Super G earlier in the week makes up for it. “I was flying in the slalom too, I was probably on one of the best runs I’ve done this season, if not ever, and I was coming on to the last steep and my outside ski went away from me, I couldn’t recover it. “I’m disappointed but watching my video through I can take a lot of positives from the skiing before that.